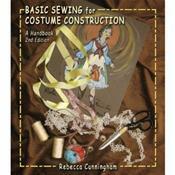 All students of costuming need to learn basic sewing techniques to build costumes for theatrical performance. Basic Sewing for Costume Construction teaches just those fundamentals. Cunningham brings decades of classroom experience as she guides readers with clearly laid-out projects covering hand stitching, fasteners, pinning, sewing, and seams. Additional material on measurement, fabric selection, and use of commercial patterns, as well as three complete construction projects, round out the Second Edition. Each project builds on the previous one to develop a full understanding of the costume construction process.